CHICAGO — Chicago’s top prosecutor injected herself into the criminal case accusing Jussie Smollett of staging a racist, anti-gay attack in January despite having recused herself, texting a deputy that the “Empire” actor had been overcharged by her own office, according to newly released texts and emails. 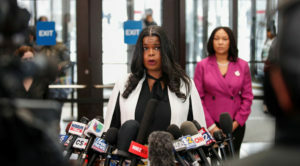 Cook County State’s Attorney Kim Foxx and her staff also scrambled later to explain the March 26 decision to drop all criminal charges against Smollett amid an explosion of public criticism, hundreds of documents provided to The Associated Press and other media through open records requests indicate. Foxx recused herself in February, her office explaining at the time that she had “facilitated a connection” between a Smollett family member and detectives after the relative expressed concerns about the case. Foxx has made sometimes-confusing statements since then, including that she withdrew from the case but did not formally rescue herself. Foxx nevertheless weighed in with a March 8 text to First Assistant State’s Attorney Joseph Magats, who became the final decision-maker in the case with Foxx recused. Questions remain unanswered about whether the office succumbed to outside pressure. Smollett had faced 16 felony counts related to making a false report that he was assaulted by two men around 2 a.m. on Jan. 29 in downtown Chicago. Investigators said he made the false report because he was unhappy with his pay on “Empire” and believed it would promote his career. The dump of thousand documents don’t include key communications among prosecutors or with Smollett’s legal team, so questions remain unanswered about whether the office succumbed to outside pressure, about the logic behind tossing the case without requiring Smollett to accept responsibility for lying, and the extent of Foxx’s involvement. Foxx’s office has faced sharp criticism from some quarters, including prosecutor advocacy groups. Smollett maintains that he’s told the truth all along. Foxx has long advocated alternatives to prosecution of nonviolent crimes. In her March 8 exchange with Magats, Foxx signaled that such an approach may be appropriate in Smollett’s case. “Just because we can charge something doesn’t mean we should,” she texted. Texts also show that prosecutors seemed to hope news wouldn’t spread widely about the March 26 hearing at which the charges against Smollett were dropped. The office made no advanced announcement about the hearing and seemed unhappy that Smollett’s attorney’s leaked word of it. “It appears as if Jussie’s press person may have notified the press,” prosecutor Risa Lanier said in a text to office spokespeople. Lanier also texted Magats as news broke about the dismissal of charges on March 26, and reporters began streaming to the courthouse, and calling and emailing the state’s attorney’s office contacting for comment.